IV. Peacetime Operations and Refits, 1939-1975. 1. At Peace in a World War, 1939-1945. The navies of other nations had engaged in ceremonial and humanitarian activities while Spain was locked in a desperate struggle. With the coming of the European war, the roles were now reversed. In February 1940, Canarias embarked on a pleasant cruise to the Canary Islands belatedly to receive her official combat flag, a gift of the islanders. The solemn festival of dedication was more a hymn of appreciation than of expectation. During these years Canarias was able to render assistance to the port of Santander, devastated by a great fire. She donated similar aid to Valencia, incapacitated by a serious inundation. The cruiser's bakeries worked overtime making bread for the flood victims. The Canary Islands greeting their namesake. 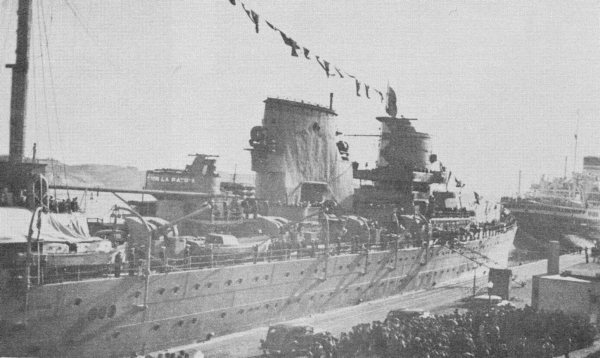 Canarias has just arrived at Las Palmas, the crew manning the rails, May 1940. The 120mm guns already have their shields. Note the absence of foremast, main battery director. Photo: GF. 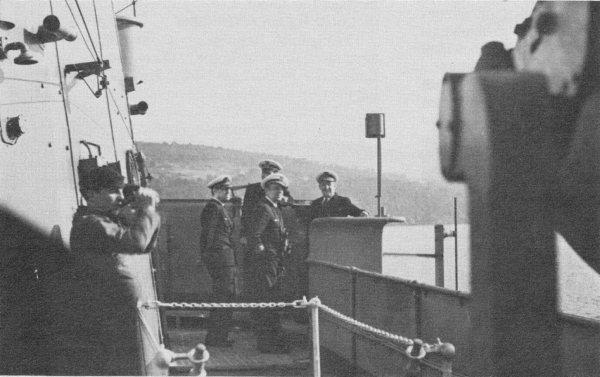 Officers on the bridge of Canarias, 1941. The truncated sides of the bridge structure are evident. Photo: GF. 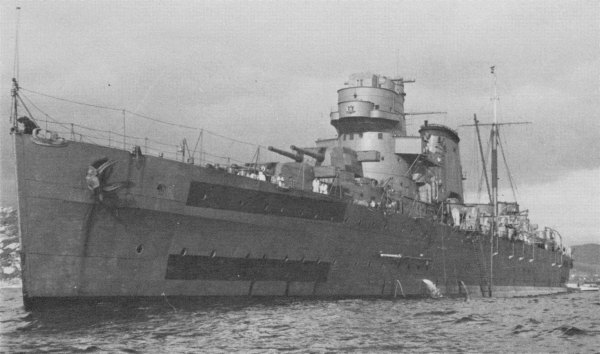 Canarias at rest, about 1944. Spanish colors, red-gold-red, adorn the sides and turrets two and three. The main battery director has been installed. Photo: GF. Another World War II shot of Canarias. The Spanish national emblem is displayed at the center of the bridge. Photo: GF. Photo left: A midships view, 1941. 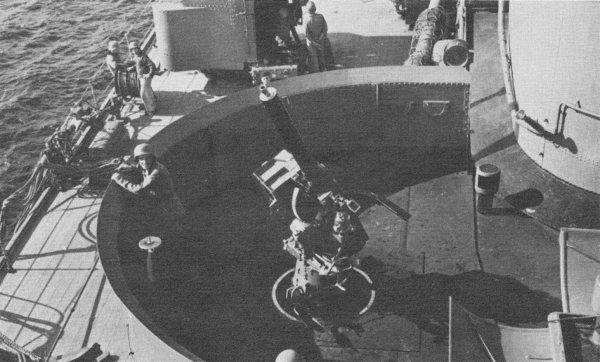 Note the 120mm shields and rangefinder on platform above what was originally intended as the catapult base. "TODO POR LA PATRIA" means "Everything for the Fatherland." Photo: GF. 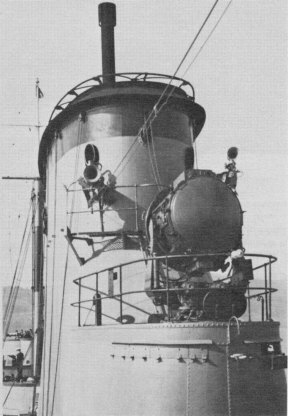 Photo right: A 1941 view of the fore end of the stack, with searlight and horn. The riveted construction is discernible. Photo: GF. 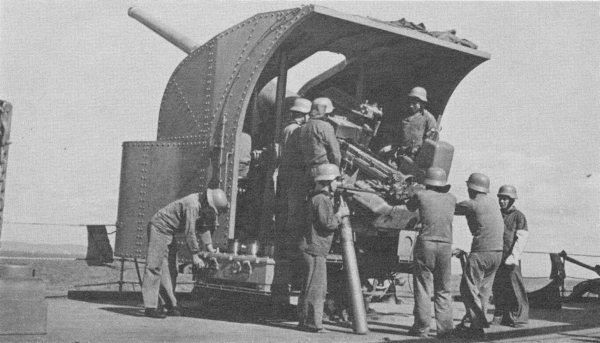 Canarias' 120mm gun crew. Note German helmets. Photo: GF. 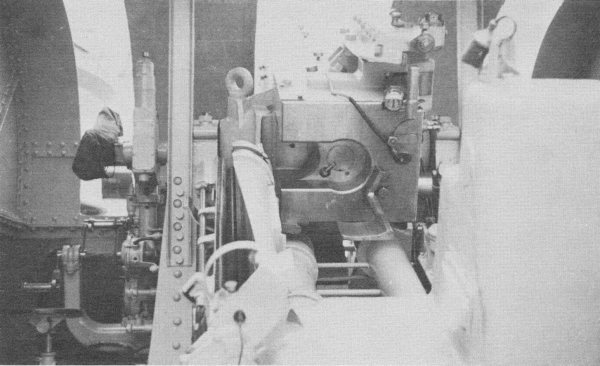 The breech mechanism of the Canarias 120mm guns. Photo: GF. One of Canarias' 20mm light anti-aircraft weapons, about 1941. This gun tube was just forward of the stack on the starboard side. Photo: GF. 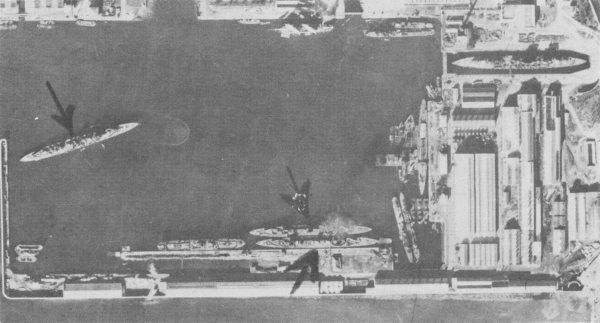 Overhead aerial photograph of El Ferrol, January 1944. Canarias is in dray dock in the upper right; the three arrows point to the three Príncipe Alfonso class cruisers. Almirante Cervera is in the right center; her two sisters Galicia (ex-Libertad, ex-Príncipe Alfonso) and Miguel de Cervantes are in the center at the bottom. The latter two ships underwent a much more thorough modernization at this time than Cervera; both are completely disarmed in this view. 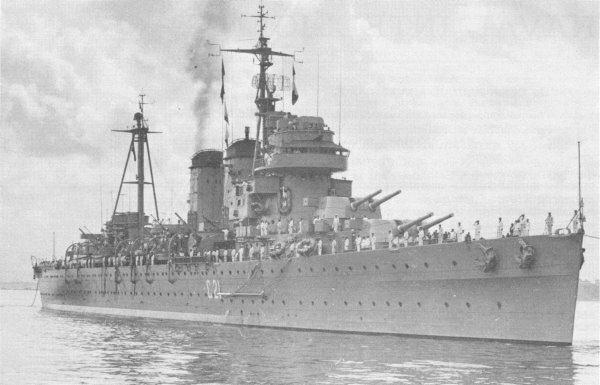 The smaller cruiser Méndez Núñez is to the right center, perpendicular to Canarias, in the process of modernization and conversion to an anti-aircraft light cruiser. Note the sail ship at top. Photograph courtesy C. W. Beilstein Collection. 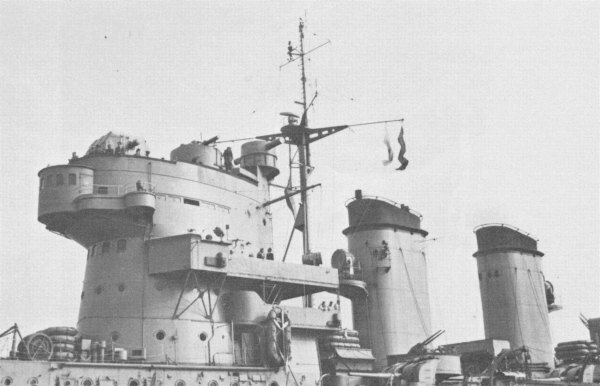 Starboard side view of Canarias in Spring of 1948. Courtesy C. W. Beilstein Collection. In October 1952 Canarias entered the yards at El Ferrol for a major refit. The after 4 pairs of German 37mm AA guns gave way to 4 single 40s. These were 40mm 70 cal. Bofors L-70 mounts built in Spain under license. Their elevation was -10° to 90°, their muzzle velocity 1,000m/sec, and rate of fire 240 rounds/min. Magazine capacity reportedly reached 12,000 rounds. More noticeable, the broad tear-drop stack came down, to be replaced by twin vertical stacks, a return to the original plan. The fore part of the command bridge became enclosed and the wings extended. The recently stepped foremast received a light bipod bracing forward and a navigational radar antenna was installed on the crosstree. Fire control remained visually directed. The hope to mount an aircraft catapult, so long postponed, was finally dropped as obsolete, the victim of radar and unhappy World War II experience with the flammability of shipboard aircraft. Canarias emerged renewed in February 1953. 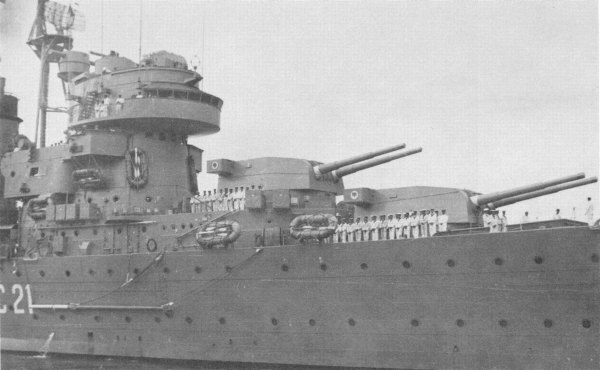 Within two years, however, she beached turrets 2 and 4 for overhaul. By the end of the 1950s, Canarias had a sturdy tripod foremast fitted to carry a suite of radar and other antennas. A few years later she added a light bipod support to the mainmast for yet another radar antenna. AII this was to be temporary, for in the 1960s the Spanish Navy planned to make up for a belated entry into the electronic age with a thorough modernization of the flagship. Preliminary plans called for guided missile armament, as other nations were doing with gun cruisers, and U.S. 5in./38 mounts or 76mm guns to replace the old 120s. The U.S. was to foot the bill. Despite the soundness of her hull and machinery, Canarias was cIearly a vessel past her prime, and a joint U .S.-Spanish evaluation concluded that a full modernization was not practicable. Newer units of the Spanish Navy could perform aImost any mission more efficiently and more cheaply. AII she had going for her was her roominess and her prestige, assets which kept her active beyond her normal years. Instead, a limited modernization was completed in 1969. A roomy CIC was built into the bridge structure, complemented by an enlarged command bridge. A larger radar shack was fitted aft. Whip antennas graced the stacks and bridge. Radars included a Decca 12 navigation set, a U.S. SG-6B surface search, and an Italian Marconi MLA-IB air search. Later she added a Marconi surface search as well. Her weaponry could have but a minor function in any conflict, but she was now suitable as a command ship for modern operations. The new look of Canarias' bridge and separated stacks, as they appeared to the camera shortly after she emerged from her refit in 1953. Note the enclosed command bridge, radar, mast supports, and weight-saving funnels. A 37mm double mount appears below the first stack. Photo courtesy E. C. Fisher Collection. 3. Diplomat, Policeman, and Cold Warrior, 1945-1974. The Spanish Navy employed to the full the impressive stature of the Canarias to symbolize the power and prestige of the Spanish State. Several times a year, port cities around Spain held her in demand for one festival or another. Officials especially desired her whenever the occasion invoIved paying homage to the heroism of Nationalist forces in the Civil War. In May and June 1952 Canarias accepted the honor of conveying the remains of Admiral Francisco Moreno, the wartime naval chief, to their final resting place in the Pantheon of Illustrious Sailors in Cádiz. Her guns carne into play anew when Canarias supported Moorish Regulars and Spanish Legionnaires defending the Spanish enclave of Ifni on the Moroccan coast from rebel Moroccan attack late in 1957. Canarias even had the room to embark the VI Bandera of the Legion for the operation. The presence of Canarias demonstrated Spanish sovereignty in Ifni again in 1958, 1962, 1964, and 1965. In 1969 Ifni joined Morocco. There was further colonial trouble in the Spanish possessions of Fernando Póo and Río Muni, both in the Gulf of Guinea. Canarias spent February 1961 showing the flag and giving support to Spanish residents. After the independence of these colonies as Equatorial Guinea in 1968, serious disturbances broke out threatening the remaining Spaniards. Canarias came again in March-April 1969 to cover the evacuation of endangered residents. In May-June 1960 Canarias journeyed across the Atlantic on a goodwill tour to Brazil and Argentina. She returned to participate in the August dedication of the Portuguese memorial to Prince Henry the Navigator just erected at Lagos. In May 1962 Canarias hosted the official Spanish delegation to the wedding of Prince Juan Carlos of Spain and Princess Sofía of Greece in Athens. Strings of lights festively traced the ship's lines and rigging while she was moored in Piraeus. Spanish sailors and marines paraded through streets of Athens and Greek dignitaries attended a candlelight banquet aboard under spread awnings. Canarias made all of these cruises at such a constant clip that she earned the sobriquet "the 20-kt cruiser." A moment of excitement came in February 1961 when Portuguese rebels seized the cruise ship Santa María on the high seas and held the passengers hostage. Canarias joined an international effort to track clown and capture the "pirates," but after she had served four days on patrol, the rebels surrendered themselves and the Santa María in Recife, Brazil. Spanish naval strategy began to shift in the 1950s. Spanish waters continued to have high strategic significance as always, but anti-submarine vessels and aircraft replaced cruisers as the chief means to guard Spanish seas and protect shipping. The navy also began to stress an amphibious capability for a limited war. To underline the probability that at least any major war would be fought by a coalition of nations, Canarias participated in numerous combined ASW and amphibious exercises with the U.S. and western European navies, particularly in the 1960s. Being obsolete as a combatant, she usually played the role of command ship or hosted the umpire. From 1950 to 1974 Canarias set forth to sea some 524 times. Canarias in her last years. The Spanish national emblem decorates the turret rangefinder ends. The wheelhouse ports are clearly visible. The overhang of the command bridge acts as a visor. Photo courtesy E. C. Fisher Collection. Canarias made a farewell voyage to her namesake islands in June 1974. A memorial now stands at Las Palmas dedicated to the cruiser. She returned to her homeport of El Ferrol for the final time on 4 July to a welcome of newer warships and small craft accompanying her to her accustomed berth. The Spanish Navy officially listed her for disposal on 2 September 1974. She was decommissioned on 17 December 1975. The Navy Ministry received numerous requests that the historic cruiser, the last of her type and a hero of the Civil War, be converted into a floating museum of Spanish seafaring. The money and the interest to carry the idea through to fruition, unfortunately, was too little. On 14 September 1977, the Spanish government put the old cruiser on the auction block for scrap with a minimum price of 62,205,636 pesetas. A Madrid firm was the only bidder.13 By early 1978, the sale was still pending as the lifeless remains of Canarias rested alongside the quay at her El Ferrol birthplace, shorn of many of her guns and fittings, and awaited the shipbreaker's torch. A few months later she had disappeared. Sic transit gloria mundi! One memento remains. A visitor to Las Palmas de Gran Canaria may see displayed on the esplanade of La Luz Castle one of the old cruiser's 120mm gun mounts, dedicated in the summer of 1978 as a permanent memorial. Over her 38 years of service, Canarias had steamed 650,000 miles, had participated in 50 war actions and numerous peacetime cruises, experienced 43 commanding officers, and wore the flag of 30 Admirals of the Fleet. She was the only treaty cruiser extensively utilized for trade warfare, for which the type was designed. Her sister, Baleares, was the first treaty cruiser sunk, as Canarias was the last to retire. More than any other class, Canarias was the epitome of the "Washington" cruiser, the symbol of an era now closed. From E. C. Fisher Collection. 11. Ludovic Kennedy, Pursuit: The Chase and Sinking of the Bismarck (New York, 1974), 196, 220, 237. 12. Official information on the modifications of the 1940s is lacking in sufficient detail, but is pieced together with the help of photographs. The naval annuals are often wrong. 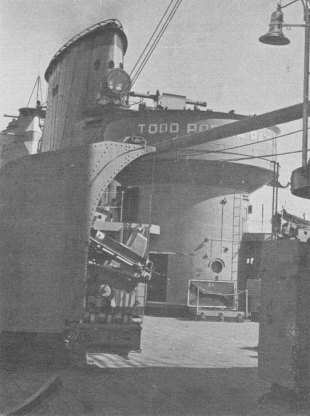 The torpedo tubes were removed at the latest by 1948, not 1960 as is often reported. 13. Marine-Rundschau, 74 (September 1977), 533; and (November 1977), 669.